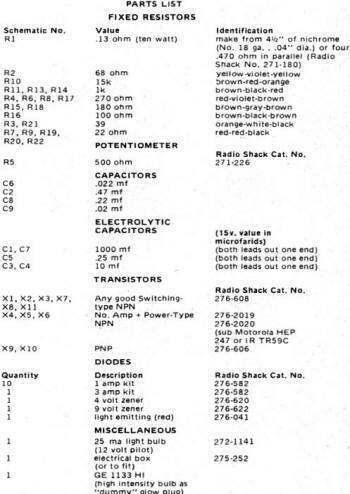 Danny M., a website visitor from The Land Down Under, wrote to ask that I scan and post this article for what today we would call a 'smart' glow plug driver. 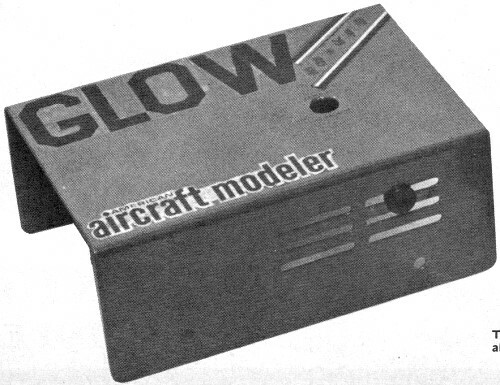 There is also an accompanying article in the same July 1974 edition titled "The AAM Glowdriver." Danny said, "I built one in 1978, it is still working fine. When a friend saw how it would light a plug under water and clear a flooded engine instantly he begged me to build him one. Unfortunately the original article is long gone, so I found your website and noticed that you list the magazine in question." 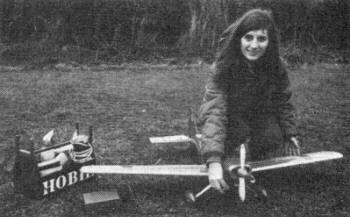 Well, thanks to our resourceful mate, now the plans and article are available again. Here's how to build an AAM Glowdriver, using a printed circuit board. 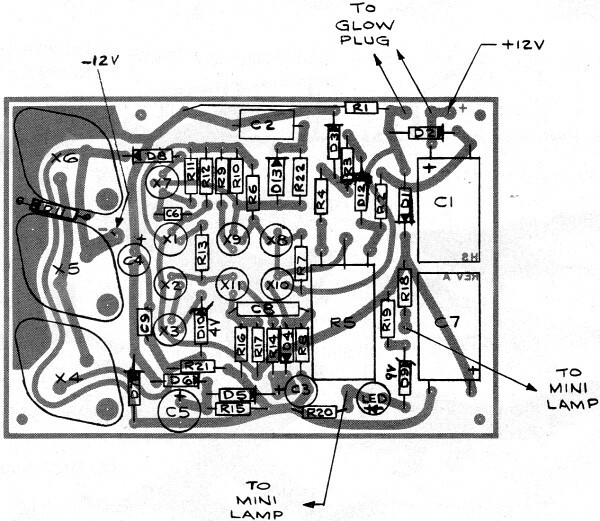 The AAM Glowdriver is ultra-simple to construct, using readily available radio supply stores. AAM Glowdriver chassis with components mounted. AAM Glowdriver PCB wired connections. 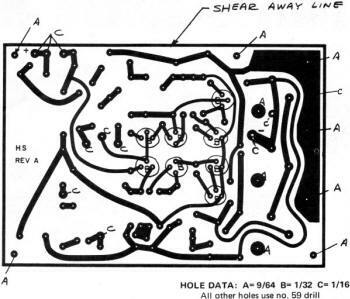 AAM Glowdriver PCB hole drilling data. Drill holes from foil side, using care and a sharp bit. Use hole data for proper sizes. A handful of components on two versions of the Glowdriver printed circuit boards. Two different types of power transistors show. Using cheaper power transistors could lead to frustration. If you can manage to talk an assistant into joining you for some cold weather flying, she will appreciate having an AAM Glowdriver (and so will you). Chin up Ducky, here comes the AAM Glowdriver. It's a new and better way to light that glow plug from your 12 volt starter battery. With flooded or dry plug, upright or inverted engine, in hot or cold weather, with fully charged battery, or almost flat, you'll go every time. The AAM .Glowdriver is a solid state, pulse width modulated power supply, which senses a given glow plug's needs and keeps it cherry red. Let me tell you how my Glowdriver came about, and show how easily and inexpensively you can duplicate it for yourself. I was becoming a year 'round flier. As winter approached at my Maryland flying grounds, it appeared to be about time to make the transition from prop-flipping to a 12 volt starter. I bought a starter and a motorcycle battery. That fateful afternoon, I realized that a dry battery was not going to be satisfactory for heating glow plugs in cold weather. A carbon-zinc battery's voltage drops significantly with lower temperatures. Nickel-cadmium cells begin at .3 volts lower than most glow plugs like. A dropping resistor could be used from one (2 volt) cell of the 12 volt motorcycle battery, but lead-acid cells vary significantly in voltage from fully charged to partially discharged. The voltage drops even more under the load of a starter, with the glow plug voltage following suit. Besides, a dropping resistor wastes the power it absorbs, dissipating it as heat. Looking for the ultimate circuit, I called Ed Sweeney to find out what new ideas might have crossed his desk. Before I knew it, I was designing a p.c. 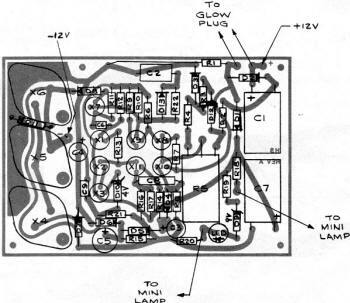 board layout for McCutchen's schematic of the AAM Glowdriver. The schematic was one thing, but when I saw a red hot glow plug stay red hot when doused with raw fuel, I was amazed. When it remained cherry red, without burning up, after drying itself out, I knew I had the answer to a starter's prayer. 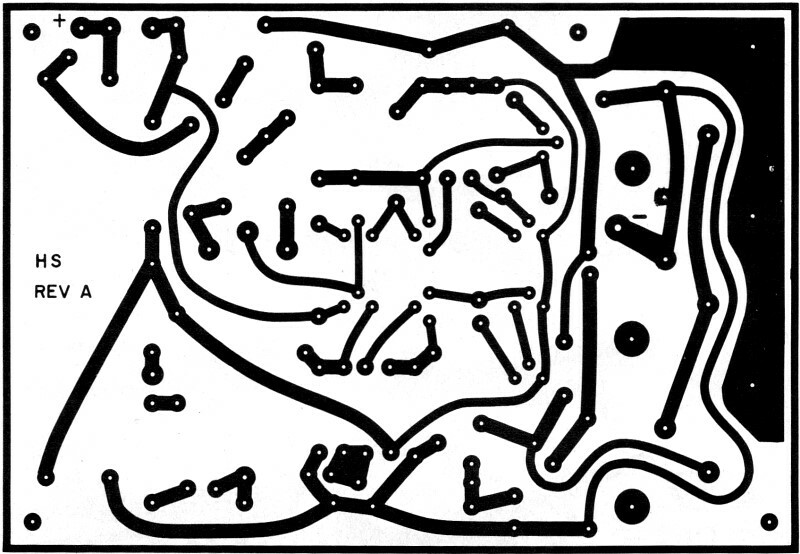 The printed circuit layout is presented here. 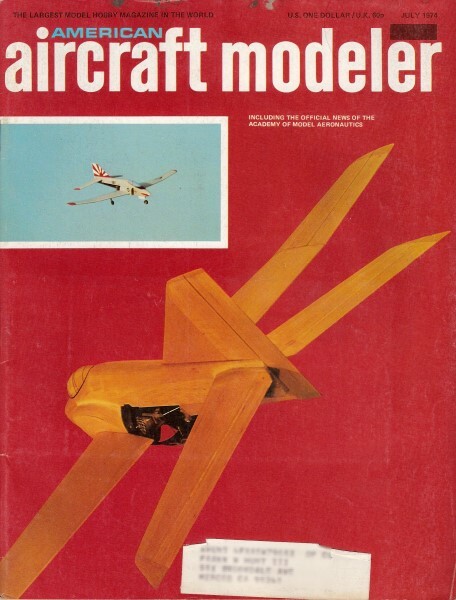 It can be photographed for photo-etching, or you may use the magazine itself as a negative for exposing photo-sensitive printed circuit material. The board could also be hand painted with resist solution for etching, if desired, using the pattern here as a stencil. Get all the goodies together and make sure the p.c. board fits the case. 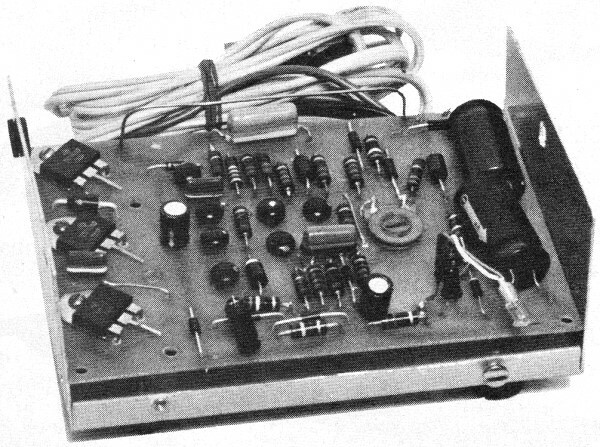 Install the components on the board, as shown in Figure 1. Check off each part as you install it, paying careful attention to the polarity of the electrolytic capacitors, diodes, and the LED. Because of the board's layout, transistors cannot be installed incorrectly, so just put their leads in the holes where they fit. The AAM Glowdriver is ultra-simple to construct, using readily available radio supply store items. Check all diodes with an ohmmeter as you go, to eliminate the potential problems of bad components. 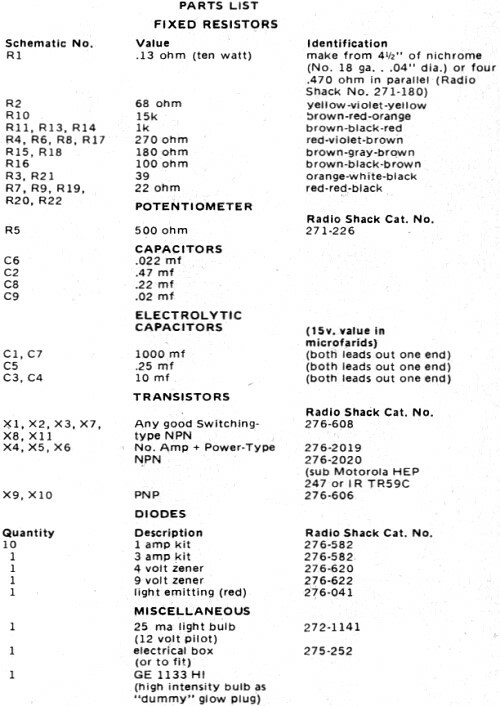 For example: on a high quality ohmmeter, the forward resistance of the diodes should be under 50 ohms. In the reverse direction, they will typically be two megohms or greater. Solder each lead to the p.c., avoiding cold solder joints and solder bridges (solder between adjacent leads). When soldering is complete, clean the copper side of the board with thinner to remove rosin. The pilot lamp, which lights if the glow plug is on, may be installed in its rubber grommet through the louvers of the Radio Shack case, or in a hole drilled in any non-perforated case you may use. Put a knot in the glow plug and battery leads before fastening them to the proper terminals on the p.c. board, to keep from accidentally pulling the leads out. After checking all components to be sure that they are correctly installed, hook up the battery leads to a 12 volt battery, and observe correct polarity (+ and -)! Turn the potentiometer counter-clockwise, to its lowest setting, and short out the glow plug leads. The pilot light should glow, showing that the circuit is on. Next, hook up the GE 1133 light bulb as a "dummy" glow plug. If it glows too brightly, quickly disconnect it and double check the wiring. If problems are evident, but you're sure that all components and wiring are correct, use the troubleshooting hints given in Charles McCutchen's Glowdriver article. Top Right: P.c. Drill Guide. Drill holes from foil side, using care and a sharp bit. 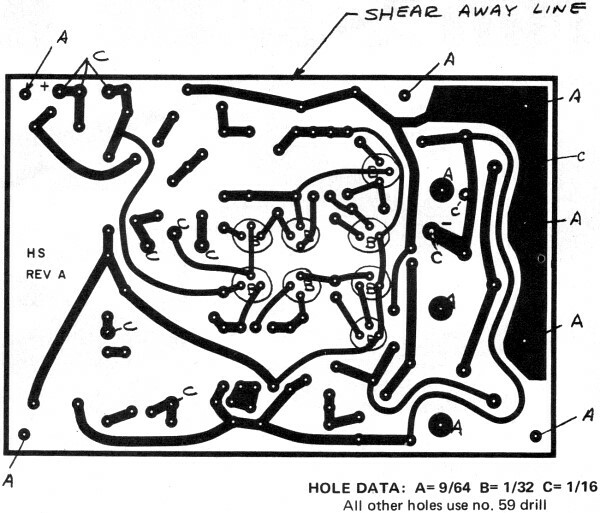 Use hole data for proper sizes. Right: A handful of components on two Glowdriver printed circuit boards. Two different types of power transistors shown. Using cheaper power transistors could lead to frustration. Hopefully, all will be well, and the dummy glow plug (light bulb) will glow nicely, but not overly bright. Listen to the little beauty pulsinq away as it does its glowdriving number! Turn the pot clockwise, and the light should increase in brightness. Turn the pot back down and connect leads to a glow plug. Now, turn the pot clockwise until the plug glows a nice cherry red (not too hot or you'll burn it out). Your Glowdriver is now ready to operate with that particular glow plug. Changing glow plugs will require readjusting the pot, and you should always begin with the pot turned fully counter-clockwise. Insulate the bottom of the p.c. board with tape, to prevent shorting, or install the board in the box with clear medium fuel tubing spacers over the mounting screws. Now you've got it. You are the first with the mostest on the flight line, and your Glowdriver makes you a member of the fast start set!